No, she’s not mine. But she spends about as much time in my yard as in the neighbor’s. 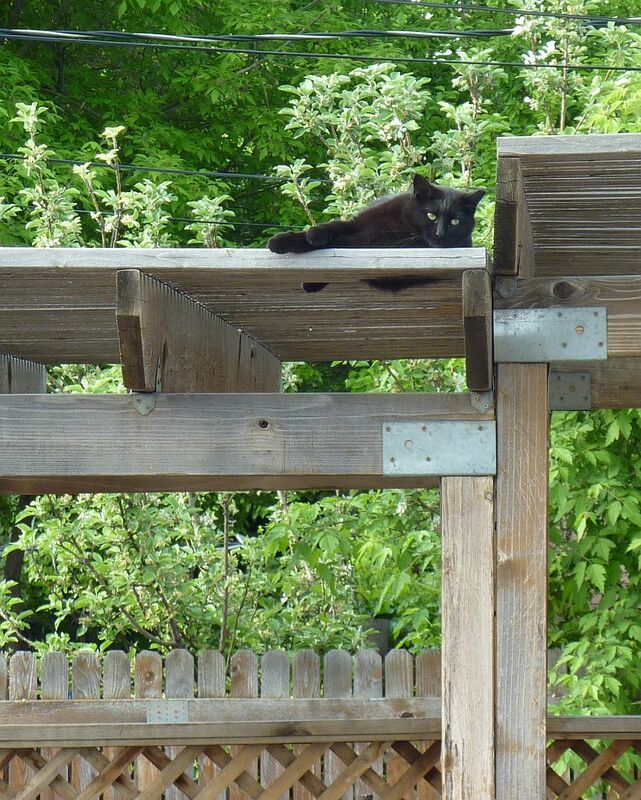 Except for when she’s on the roof of his deck. She’s one of the stray kittens from a year and a half ago – the only female and runt of the litter. The silly girl got stuck under our deck twice during the winter, and both times was under there for days before we found out she was there when we heard her meow as we shoveled snow. We’re still not sure how she got under there in the first place, but I think she crawled in through a small area where a tree stump comes up through the deck, then got stuck when we had heavy snowstorms that covered the opening. I stuck chicken wire in the opening to make sure it didn’t happen again. Then her big brother Fluffy also got stuck under there for a few days, but that was because we’d been using a shed attached to the deck, and the door was left open for a little while. Oy. Now brother Spooky has been missing for a few weeks. He’s the one peeking over the fence in this photo. 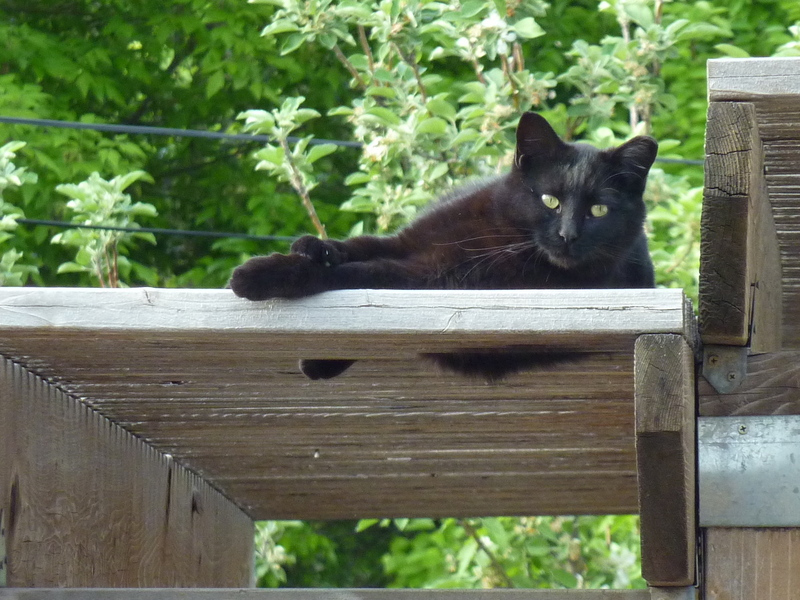 But at least this time, we don’t seem to have a cat under the deck. Perhaps he decided that three’s a crowd. Boo looks like a very satisfied kitty. But it sounds like the whole family needs a little help in the “not getting stuck” department! Perhaps she was trying to stay warm in the winter? Fat glossy kitty! I can appreciate them because they are not mine. Fluffy gone!? Boo looks very content to sit back and watch life go by (and the birds, too!). Ohhh, I love Boo! Black kitties are my favorite. I hope Spooky turns up soon. I hope Spooky is visiting around, rather than missing. Boo is adorable and looks hella comfortable.